A beautiful destination for Superyachts deserves a beautiful marina and anchorages and, happily this is the case for vessels arriving at Tahiti’s Marina Taina, the main Pacific Hub, with Papeete Port in French Polynesia coming in second. The popular Marina Taina is located five miles west of Papeete Harbour and was the first superyacht facility in French Polynesia, built in 1994 and expanded in 2004. Etienne Boutin, heading up Asia Pacific Superyachts Tahiti and host to Superyachts arriving in Tahiti for over the past 15 years, reports: “Marina Taina more than meets esthetic expectations in offering a safe, quiet and pollution-free environment in a beautiful lagoon. The marina is close to Faa’a International Airport, Papeete city amenities and within walking distance of excellent dining and the Carrefour Shopping Mall, home to the largest supermarket in Tahiti.” Two cement docks at the marina are reserved for luxury yachts and capable of handling up to 27 units at the same time (stern-to mooring with anchor and lines on bottom moorings - Depth 3 to 15m). Services include electricity (220 V/ 380 V - Three phases - 60 Hz. - 60 to 250 Amps), fresh water, marine gas station with fuel delivery on board by pipe, two restaurants, two dive clubs and various repair shops. Marina Taina can accommodate about 550 boats and pleasure boats, pump for sewage, laundry, master's office, sanitary facilities, workshops and technical access to the beach with blanket Internet Wi-Fi and shops nearby. The marina is recognised for receiving the respected eco-label 'Blue Flag' in 2012, created by the French Office of the Foundation for Environmental Education in Europe in 1985. Papeete Port is the second choice for most yachts arriving in French Polynesia and the only suitable dock in Tahiti for yachts over 65 meters. 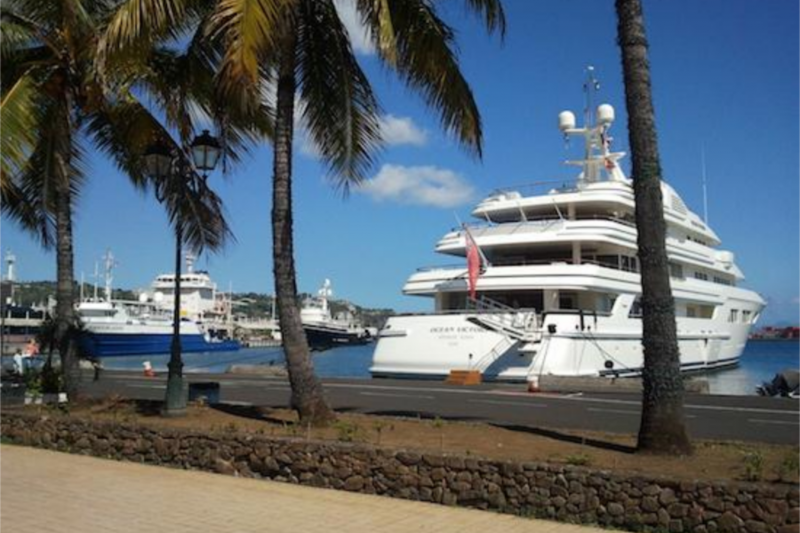 The port is a convenient stop for shopping and repairing as well as enjoying Papeete activities after long sea passages. Fuel and water are available from pipes. Papeete downtown will very soon have a used marina, one that is currently under construction and due to be delivered end of April 2015. It will mostly cater for yachts in range 30’ to 75‘; with 3 berths for 35m yachts. One of the cruise ship’s finger quay will be included inside the marina precinct to offer a more “yacht friendly” alternative downtown for large visiting yachts. Bora Bora – the most famous of French Polynesia's Leeward Islands was recently awarded the title of “The best island in the world” by U.S useds. Etienne Boutin reports, “The island of Bora Bora has a nice marina, the MAI KAI Marina, and features a great restaurant and very friendly service.” However, Etienne says, “Most yachts visiting our islands in French Polynesia still prefer to drop anchor in the stunning and protected anchorages of our 130 islands”.